At exactly 5.23pm yesterday, my journey around South America underwent a major shift in character. As I rolled out of a warehouse in the grubby port of Antofagasta and started to drive back to Calama, I was no longer riding alone. Paulina has bought a moto and we will be riding to Mexico together. For now at least, my days of riding solo are over. Getting to this point has not be an easy process. As I took a few days of R&R in Calama to clean my bike and kit after following the Dakar, Paulina finally decided she wanted to take the plunge and ride north. She had found a small, white Suzuki DR200 and had set her heart on buying it. So I left my moto here and took a 22 hour bus ride south to Santiago to help her prepare for the trip. We bought the Suzuki off a lovely old gentleman called Moses in Varparaiso. He has advertised the wrong mileage, thinking that the odometer read kilometres when in fact it is miles, but nevertheless I reckoned the moto was in great condition – With Moses at the helm for the last four years, I doubt she had ever known a life above 50kph. 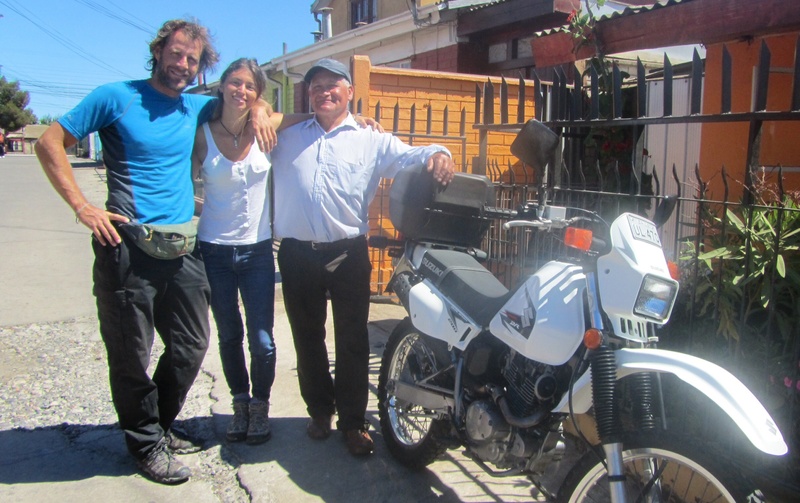 The next few days in Santiago saw Pau and I riding the Suzuki across town and back several times, looking for the necessary parts to bring the bike up to off-road specification. 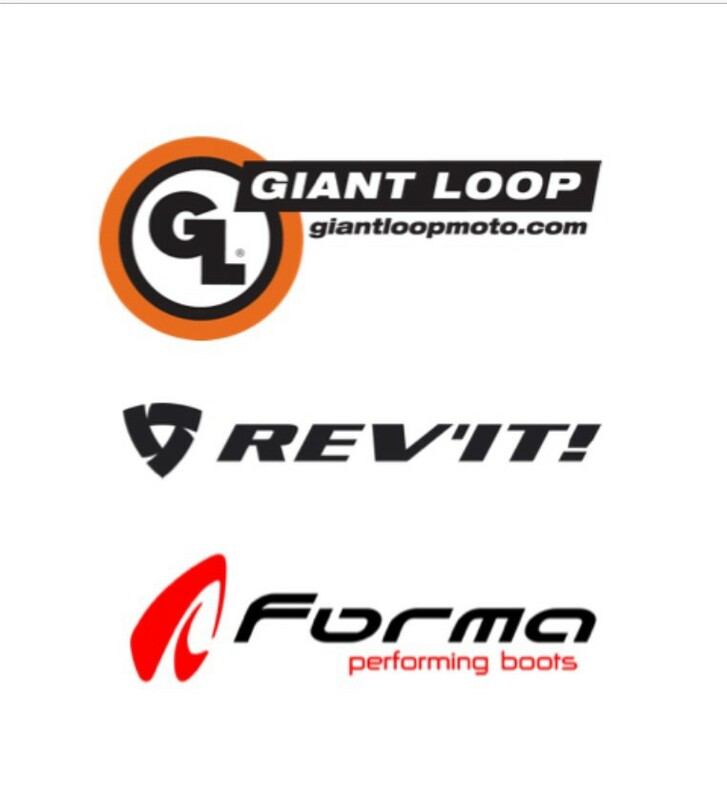 We also needed new tires, new riding boots and other bits. Santiago was hot, impatient and claustrophobic. It wasn’t much fun, but we got the job done. When we eventually put the moto on the lorry which would transport it north, we were both desperate to escape. Another 22 hours and we arrived back in the relative calm of Calama to await the arrival of the little DR200. It was due to arrive on Tuesday. That evening we were told it was in town and we could collect it on Wednesday morning. But then the Universe played its South American joker again. 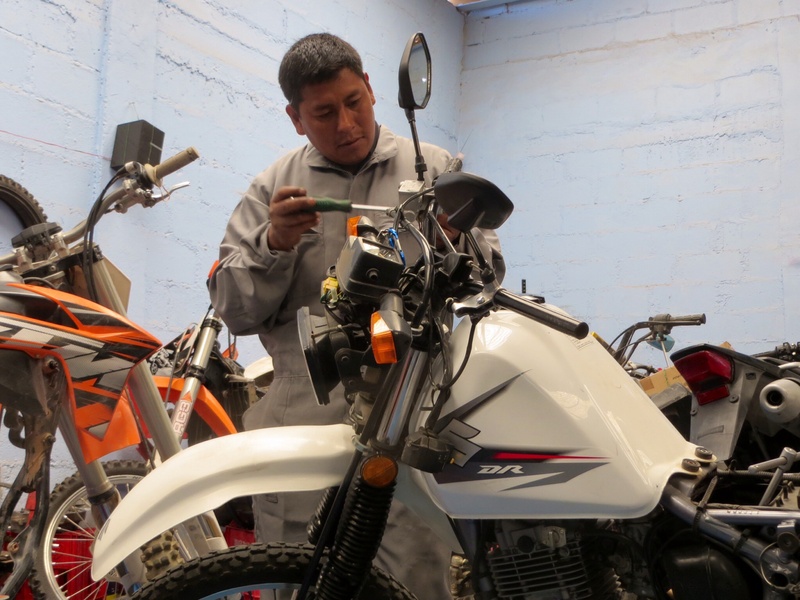 The moto wasn’t in Calama, it was in Antofagasta 200km south – and there wasn’t going to be a lorry coming this way to deliver it until next Monday. At this point, it was time to deploy the tried and tested maxim, “If you want something done properly, do it yourself.” We decided to ride down to Antofagasta together on the Tenere the following morning and bring the Suzuki back ourselves. Armed with the address of the warehouse and a phone number, we duly set off. For 15 months, I have avoided being stopped by the police in Chile, Argentina, Bolivia and Peru for overlooking their respective highway codes. A totally clean sheet – impressive, I thought. Yesterday en route to Antofagasta, I was stopped twice by radar-wielding – and very polite – Caribineros: 92kph in an 80 zone, then 120 in a 100. I played the ignorant gringo, Paulina removed her helmet and smiled sweetly, and the Caribineros asked us to slow down and wished us a good ride. A bad omen, stopped twice within the space of one hour? Or a good omen, being let off? I wasn’t sure. At 12.30pm, we pulled up outside 4688 Avenida Iquique. We were at the address given to us for the haulage company, but they clearly weren’t. The place was locked up, and we learnt from a neighbour that they had moved six months ago. We both new that the phone call we then made to the girl in Calama who was supposedly organising this whole venture was merely a token gesture. We got on to Google and eventually found what seemed to be the new premises. We located it, and it was indeed the correct place, but everyone had gone to lunch. We had two hours to kill. There was nothing else to do except drive to the market, find a place to eat and calm down a bit. At 4pm we eventually set eyes on the elusive Suzuki. She had clearly been knocked off the base we had secured her to – wing mirrors had been bent, part of the front wheel axle was damaged and an indicator had been knocked out of place. Yet no one would take any responsibility for this shambles. A moto delivered to the wrong city, the owners having to ride 440km to collect it, two days late, and damaged. From the response we got, it seemed that this was par for the course round here. Paulina let off a bit of Latino steam at a couple of people, I went to work repairing the axle and fitting the front wheel and then we were done. Finally on the road. 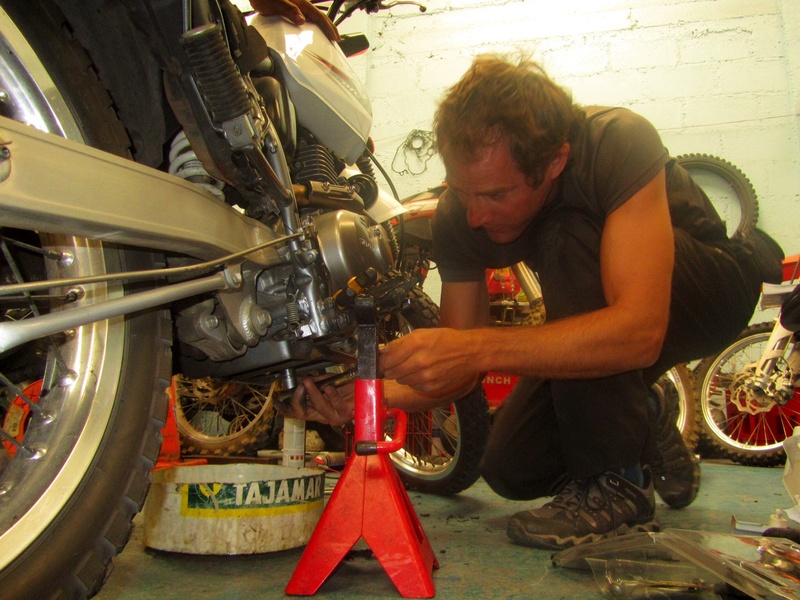 Today we are working on the moto with the help of the super laid back and helpful Edwin from the local garage, fitting protection, changing the oil and checking the motor. After the last few days, I’m not holding my breath – but we hope to be on the way to Bolivia tomorrow. On reflection, despite the frustrations of the delay and the hassle, these are the sorts of days that give a road trip character. A challenge overcome adds richness to the experience, as do the places and people you would otherwise not meet. If it’s easy to write a blog entry about it, you’ve had a good day.